Merry Christmas! Since today is a celebration with family and friends for many people, it seems an appropriate day to share the holiday card that I mass produced for family, friends, and colleagues. I made about 40 of this design some in the pink/red color scheme you see here and others in a blue on blue color scheme to mix things up. 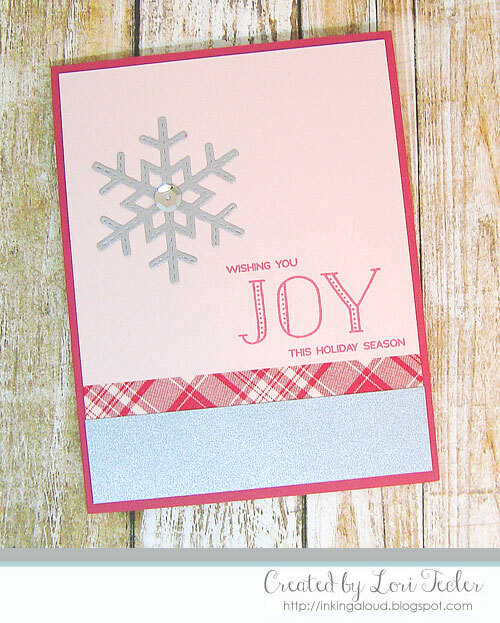 The sentiment is a combination of stamps from Avery Elle's Sending Peace stamp set. Using my MISTI to stamp the sentiment helped to speed up the process. Once the sentiments were stamped, I adhered washi tape below the words along with a strip of silver cardstock. A die cut stitched snowflake was adhered in the open space above the sentiment. I dotted the center of the flake with a large silver sequin for some extra sparkle without adding much thickness--an important consideration when mailing lots of cards!